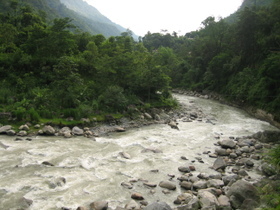 The 110 km journey from Darjeeling to Gangtok is very scenic as you drive along the river Teesta. The local authorities have posted many signs along the roads to warn drivers to drive carefully and slow down. 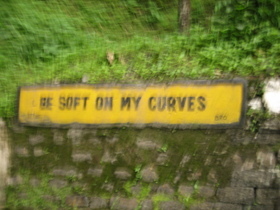 I snapped the one below just we turned the corner at high speed on a winding mountain road. 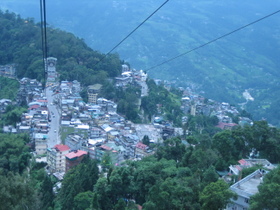 Aerial view of Gangtok city from a ropeway car. Gangtok is the capital of Sikkim, an erstwhile Himalayan monarchy that joined India after a successful referendum in 1975. Sikkim has eco-friendly laws unique for India. Plastic bags are banned in Sikkim and the laws against littering are strictly enforced. Vehicles are banned from entering Gangtok after 6 pm, making it a pleasure to walk around this charming town in the evenings. Gangtok doesn't much offer much within the town itself but there are many neighboring monasteries worth visiting. The local restaurants are farily unexciting so don't expect much by way of food.